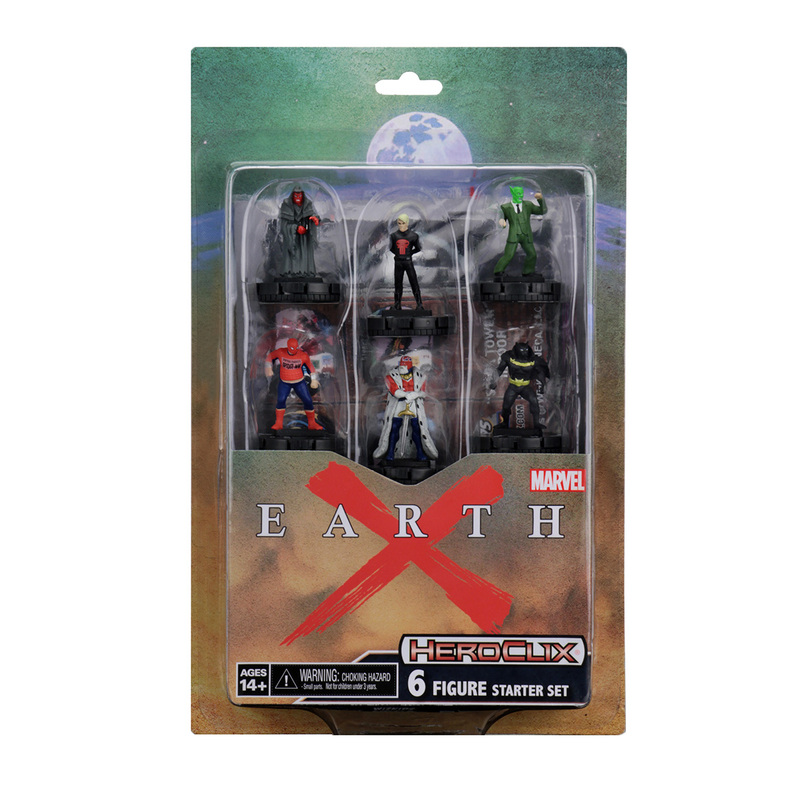 The Earth X Starter Set includes 3 terrifying villains and 3 iconic heroes from the world of Earth X. Whether you want to manipulate your opponents with the likes of Spiders-Man or teach your allies the ways of Great Responsibility, this Starter Set has something for you. For the first time in Marvel HeroClix, you’ll get to take advantage of location maps! The Earth X Wakanda location map and the Stark Tower location map featuring the Iron Avengers will be sure to add awesome powers and effects to your teams! Along with these six awesome figures, this Starter Set includes everything a player needs to learn and start playing HeroClix today! From the figures to a Heroclix Rulebook, a double-sided Map, a Powers and Abilities Card (PAC), Object tokens, terrain tokens, dice, and character cards. Get this otherworldly Starter Set today to start your HeroClix adventure or bolster your expanding collection. See never-before-Clixed characters alongside the most recognizable characters, like Spiders-Man, Venom (May Parker), Fancy Dan, The Skull, King Britain, Stegron, Clea Sorcerer Supreme, Mattie Franklin, and Mister Negative! Much like when readers saw the Earth X comics for the first time – There are going to be some BIG surprises as you open these boosters! 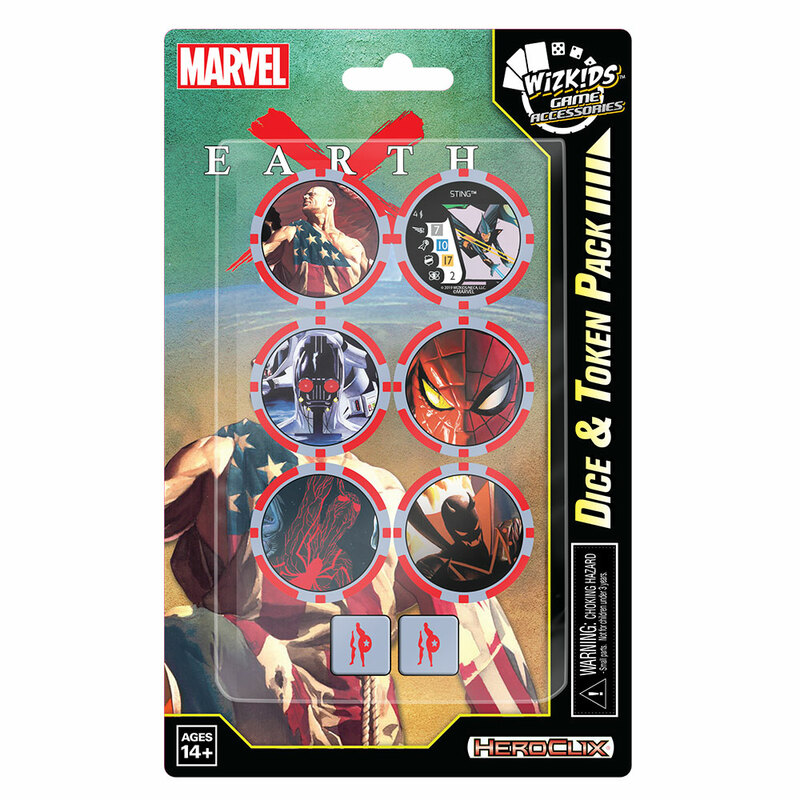 The Marvel HeroClix: Earth X Dice and Token Pack contains 2 custom dice featuring a special icon to celebrate the release of the Marvel HeroClix: Earth X Booster Brick! The 6 action tokens and dice icon are themed around Earth X! These tokens also feature special “Iron Avengers” bystanders on the back that can be generated with the Iron Man figure found in Earth X boosters, and the Stark Tower Location Map found in the Earth X Starter Set!